The top-seeded Carleton Ravens are once again Canadian university men's basketball champions, rolling over the previously undefeated Calgary Dinos 83-49 in the national final in Halifax. 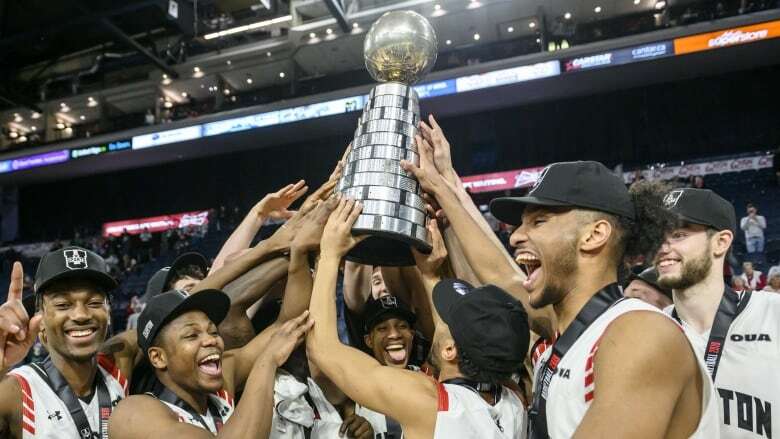 The Carleton Ravens are back on their familiar perch as Canadian university men's basketball champions, after blowing out the previously undefeated Calgary Dinos 83-49 in Sunday's national final. The Ravens were propelled to their 14th title since 2003 through superior shooting and rebounding and a relentless defence that stifled the Canada West champs who were going for their second consecutive W.P. McGee Trophy. Carleton, which has now won eight of the last nine titles, was paced by fourth year guard Yassiin Joseph's 20 point performance. Guard Munis Tutu chipped in 18 points while player of the game Eddie Ekiyor scored 12 points and hauled in 15 rebounds. Ekiyor was also named tournament MVP. "It feels great," said Ekiyor. "We've been through so many ups and downs as a team and it feels good to finally get this." The six-foot-nine centre from Ottawa was a constant presence throughout the tournament, using his long wingspan to clear the glass on the defensive and offensive ends of the court. He also hit several key buckets over Carleton's three game run. Ekiyor said the key to Sunday's final was the Ravens's quick start and ability to limited the few runs managed by the Dinos. "We wanted to defend and do everything we could and be as tough and fight as much as we could," he said. "As a team, we really defended." He said Carleton's overall depth was also an advantage. "Even the guys who are redshirting, I think they could start on other teams across the country so I think our depth really causes problems for teams. Teams can't go 40 minutes with us." The Ravens had a 40 per cent field-goal percentage while knocking down 10 of 30 three point attempts. Calgary was held to just 25 per cent shooting from the field. Fifth-year point guard Mambi Diawara was top scorer for the Dinos with 13 points. The Ravens raced off to a 9-0 lead and never looked back in the much anticipated matchup of the tournament's top two seeds. They managed to hold the Dinos without a field goal for the first eight minutes of the game. Two three-pointers in 40 seconds ended the drought for Calgary, which managed to close within seven points by the end of a quarter that saw Carleton with a 20-13 lead. But that was as close as the Dinos would get as Carleton stretched its lead in the second quarter behind the hot shooting of Tutu, who lead all scorers with 16 points in the first half. The Ravens held the Dinos to just 10 points and headed to the dressing room with a 44-23 lead. The second half proved no different as the Ravens poured in another 39 points. As Tutu continued to ramp up his own defensive game his hot hand cooled and Joseph picked up the pace scoring 12 of his 20 points. "Munis brought so much energy on defence and offence, he rubbed off on me," said Joseph. Carleton went 22-1 on the season and reached the final in Halifax by squeezing past host Dalhousie Tigers 76-65 in the semi and drubbing No. 8 Alberta 100-60 in the quarter-final. The only loss suffered by coach Dave Smart's team came at home in late January when the Ravens dropped a 78-74 decision to Ryerson. Smart said his program's run of success is something he and his players feed off. "I was in my hotel room watching the final last year," he said. "I know what it's like not to be here. It wasn't fun and this is a lot more fun for me." Smart said it was his team's tight game with Dalhousie in the semifinal that set the stage for the championship game. "In a weird way it made our entire team feel we were the underdog tonight. I think they played like the underdog tonight in terms of just playing with the fire and attack mode that an underdog has to play at to win." The Dinos were attempting to cap off a season that saw them go 26-0 during the regular season and playoffs. Ryerson defeated Dalhousie 84-66 earlier Sunday to capture the tournament's bronze medal.